Take a trip to space and get the chain reaction going! Chain Reactor is a bit different from your typical slot game, with a 5x5 playing grid and exploding icons leading to huge cash prizes! 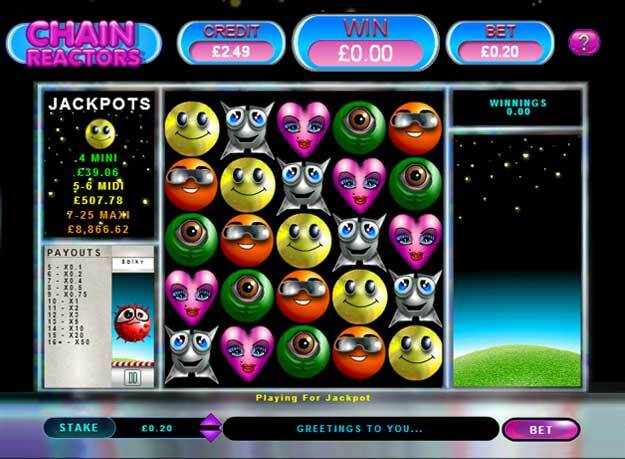 Chain Reactor is a little different to your usual slot game. It gives you the chance to try out something different and rather than spinning the regular reels you have the chance to bet across a 5x5 grid. Balls drop into the grid and you're looking for five or more to group together, explode and net you a cash prize. It has an intergalactic space theme and Chain Reactor game is bound to be a good choice if you're looking for something different!